Bob F. Perkins, a Charter Member of the Gulf Coast Section of SEPM and Executive Director of the GCSSEPM Foundation for the past sixteen years, died unexpectedly on April 11, 1999 at his home in West Hartland, Connecticut. His death closes an extraordinary life of dedicated service to the science of geology and paleontology, in particular, of a career dedicated to higher education, and especially of his most generous devotion of time, talent, and organizational abilities for the Gulf Coast Section of SEPM Foundation. In essence, Bob was the Foundation. Through his personal efforts with the annual research conferences, the organization achieved international prominence among petroleum industry geoscientists and with university geology faculty and students. Bob F. Perkins was born in Greenville, Texas, just northeast of Dallas, the city in which he grew up. He attended Southern Methodist University from which received his BS and MS degrees. After spending two years in residence at the University of Michigan he taught at SMU and the University of Houston as he was working on his Ph.D. Bob joined Shell Development Company in 1957 to work with Frank Lozo in carbonate research. In 1966 his academic interests brought him to Louisiana State University's School of Geosciences where he ultimately became Chairman. I believe it was here that Bob discovered and nurtured his love of editing and publishing quality books. Through his efforts, the series Geoscience and Man was created, and he edited many issues featuring articles on geology, paleontology, geography, anthropology, and archaeology: all units of the School of Geoscience. In 1975, Bob returned to the Dallas area to accept the position of Professor of Geology and Dean of the Graduate School at the University of Texas at Arlington. After serving twenty years in this position to 1995, one would think that Bob would have been content in his retirement to put his feet up and let other folks do all the work. However, he continued on as Executive Director for the GCSSEPM Foundation. Not only did he continue to handle the affairs of the Foundation, he also continued to maintain the membership database file of the Section and was editor and publisher of the Section's quarterly newsletter. The first very successful GCSSEPM Research Conference was held in 1980. Bob was Vice President of the Section in 1978-79 and President in 1980-81, and was also Co-chairman of the steering committee for this initial conference. He immediately recognized the value these conferences would have for the petroleum community and researchers in academia for the dissemination of focused geological topics. 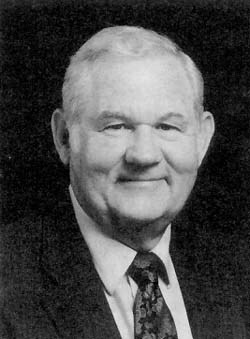 In discussions concerning the preparations of the 1980 conference, Bob proposed the creation of the GCSSEPM Foundation that would be responsible for the conferences. And it would also be established as an IRS 501(c)(3) tax exempt entity in order to accept donations from corporate sponsors and individuals for financial support of the research conferences. Thus, in 1983 the Foundation was chartered and the third annual GCSSEPM Research Conference was the first to be sponsored by the Foundation. Owing to his penchant for organizing, editing, and publishing, in 1983 Bob volunteered his services as Executive Director of the GCSSSEPM Foundation and continued in this role until his untimely death. Bob Perkins' efforts for the annual research conferences sponsored by the GCSSEPM Section's Foundation have placed them into national and international prominence as the yearly sedimentary geology research meeting to attend. One can state that the continuing success of these popular conferences can be attributed directly to Bob's multifaceted skills. Once the technical theme was selected, with designated Co-chairmen and committee, Bob worked with the authors and this team in editing manuscripts for the Proceedings Volume. Bob worked directly with the printer in having the volume printed and shipped for the conference. These volumes provide a permanent legacy of the conference and are tools for reference and further research. Several conference Proceedings Volumes have been reprinteda clear testimony to the continuing relevance of the technical materials contained. In addition to the technical aspects of each meeting, Bob made all arrangements with the conference facility, right down to the selection of the luncheon menus. Another extremely valuable service was that he personally handled all advance registrations for the conferences. This often meant responding to many e-mail messages and occasionally answering international phone calls at o dd hours of the night. In addition to these activities Bob also handled all conference advertising and publicity. Therefore, the impact he had on these conferences was tremendous. I can think of no one who has done more over the years to continually place first-rate worldwide geological information in the hands of both academic and industry colleagues. Bob was active with Foundation activities almost to the time of his death. From July 1998 until March 1999 he labored with the editing for the publication of the GCSSEPM's Taxonomic Equivalency Project Committee's book titled Gulf of Mexico Basin Biostratigraphic Index Microfossils: A Geoscientist's Guide, Foraminifers and Nannofossils—Oligocene through Pleistocene. The editing was completed in mid March and he personally printed and shipped from his home copies to be sold at the April 1999 AAPG Convention. This was no small undertaking as the book contains 215 illustrated data sheets, two tables and three chartsall of which had to be assembled into three-ring binders. His superior skills of formatting and style for publications are clearly evident in this attractive and useful reference book. Bob was a prolific author as well as a gifted editor. During his early academic career he was an avid researcher of Cretaceous rudistids and many of his early publications focused on the systematics of these fossil mollusks. Through the years he de veloped an extensive collection of these Cretaceous reef-builders. Only recently did he donate the collection to the Paleontological Research Institution for preservation for future researchers. Bob was a prolific author. He also published on the paleontology and paleobiology of Mesozoic reefs in the Gulf of Mexico, Caribbean and Mediterranean basins and the paleoecologic and biostratigraphic implications of trace fossils. When writing his SEPM Honorary Membership Award citation for 1998 he provided me a "selected publications" list of his works that contained twenty-two titles. However, a search of the Geo-Ref archives reveals over one hundred and twenty citations. In addition Bob was an Ad Hoc Editor for many scientific journals including the Journal of Paleontology, the Bulletin of the American Association of Petroleum Geologists, Journal of Sedimentary Geology, Science, Palaeogeography-Palaeoclimatology-Palaeoecology (Amsterdam), various research publications of the Instuito de Geologia de Mexico, and for the Tulane University Studies in Geology series. In addition to the Gulf Coast Section of SEPM and the Society for Sedimentary Geology (SEPM), Bob belonged to many professional organizations. Among them are: Society of Sigma Xi, Fellow of the Geological Society of America, Fellow of the American Associa tion for the Advancement of Science, The Paleontological Society, American Association of Petroleum Geologists, Paleontological Association (Great Britain), and the Malacological Society of London. He was especially generous with his time for the Society of Sedimentary Geology (SEPM. Bob served on their Research, Publications, Nominations, and Trace Fossils Committees. He was the organizer and leader of many field trips associated with meetings from 1971 through 1983. Also, from 1968-1973 he served as The Paleontological Society representative to the Executive Council of the American Association for the Advancement of Science. Through the years Bob received many professional honors and awards. As mentioned earlier, last year he received Honorary Membership in the Society of Sedimentary Geology (SEPM). He was awarded Best Paper Presented at the Society of Economic Paleontologist s and Mineralogists Annual Meeting in 1966. Bob received in 1971 and 1974 Special Citations for Service to SEPM, and received similar citations for service to the GCSSEPM in 1979, 1980 and 1981. He was appointed an Honorary Member of the Gulf Coast Section of SEPM in 1984 and in 1991 the GCSSEPM presented him with a Distinguished Service Award. Bob F. Perkins meant so much to so many of us that it will be difficult to carry on without him. He truly was the "heart and soul" of the GCSSEPM Foundationsomehow we must pick up the many tasks he once did, but we will never equal his professional and personal standards. Bob is survived and very missed by his wife Patricia; daughters Katie and Marianna; son Orrin; granddaughters, Rosalind and Renata; and by too many friends and colleagues to mention.